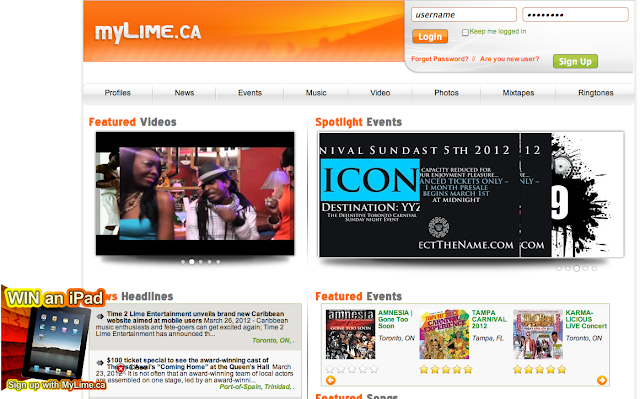 Caribbean music enthusiasts and fete-goers can get excited again, Time 2 Lime Entertainment unveils brand new Caribbean website aimed at mobile users. LIME ANYWHERE! Take your favorite Soca songs with you everywhere on your mobile device! MyLime.ca is an all new Caribbean website focused on delivering fresh content daily and is geared toward satisfying users with the best mobile experience. Their mission is to provide users with the most convenient access to Caribbean media entertainment, including music, news, events, videos and ringtones delivered through a simple and user friendly web interface that is also accessible from any mobile device. MyLime.ca offers means to share media content to help users expose themselves and their peers to others with similar interests or working within the same industries.